ON IN THE RIVER MEDWAY, at Rochester, a number of sailing barges may often be seen lying at their berths. The barge in the foreground of this photograph has a standing gaff on which the upper edge of the sail is extended. All the other barges have sprits, and their sails are brailed up to a point just under the masthead. ONE of the most remarkable and picturesque of the world’s types of sailing craft is the spritsail barge, still to be found in large numbers on the Rivers Thames and Medway. The type is occasionally seen, also, in a few other counties of England, although it has never really taken deep root far away from the Thames Estuary. and-aft rigged vessels were borrowed from the Dutch at the time of the Restoration, but the Thames barge, with slight differences, of which many are within living memory, goes back much farther than that. Her principal feature is the sprit mainsail, which differentiates her from every other type. Instead of the head of the mainsail being bent to a wooden gaff, by which it is hoisted or lowered, a heavy wooden sprit - always called “spreet” by bargemen - is permanently in position, its heel at the foot of the mast and its head at the peak of the mainsail. The sail is, therefore, never lowered; when it has to be taken in it is brailed up to a point just under the masthead, a job within the power of one man with a small winch. Setting the sail is equally simple. This spritsail rig was certainly popular on the London River in the fifteenth century, and the general principles of the hull are older still, although the particular rig and the particular hull were not combined until the middle of the seventeenth century. It has to be admitted, however, that there is a strong Dutch influence in some of the features of the barge as she exists to-day, and they are some of the best features that she has. There is nothing pretentious about the Thames barge. She is just a plain workaday ship excellently adapted to her purpose and a fine sea-boat that is astonishingly fast and weatherly. There is not another type of vessel in the world capable of carrying 300 tons as well and as regularly as she does with a crew of only two men and a boy and with no expense for fuel. Her success is largely due to the Thames bargeman, a magnificent type of seaman who knows how to handle his unwieldy-looking vessel in the manner of a yacht and who takes every possible advantage of tide and wind so that he can keep a schedule that seems impossible for a ship without engines. Generally speaking, at the end of a voyage he delivers his cargo in excellent condition, for the sailing barge is splendidly built and is usually well maintained for the class of work that she undertakes. Some are kept for many years on the cement trade, in which the least damp is fatal to the cargo. More than one of these barges has lasted, in trades of steadily declining importance, for longer than a century. Undoubtedly one of the great advantages of the Thames barge is the handiness of the spritsail already mentioned, which can be handled by one man. Another is that, with her mainsail brailed up, she will handle remarkably well under topsail alone, or under topsail and fore-staysail. The manner in which a barge under this shortened canvas will edge her way through traffic and obstacles to her wharf, or carry on in more open water through half a gale, is always a matter of particular admiration to yachtsmen. It is not easy to trace the evolution of the barge’s design. Artists rarely painted them except as a detail in a picture of another subject. The barges have, however, been made the subject of a special study by a number of experts who have contrived a connected though somewhat patchy history. In early times the barges on river and coast can have had but little claim to beauty. As the coaster developed, the evolution of the barge proceeded, more slowly. 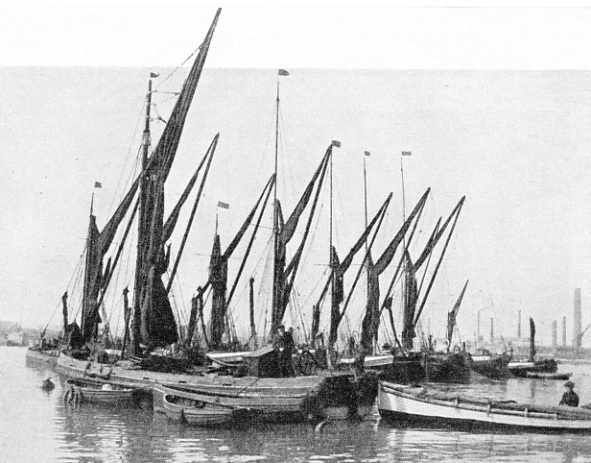 For centuries the Thames barges had the more normal gaff-and-boom mainsail, while the spritsail rig was reserved for other types of craft in the river. The advantages of this rig, however, were obvious, and once it was adopted by enterprising barge owners it made rapid headway. Until early in the nineteenth century all the spritsail barges were cutter-rigged; it must be remembered that they were much smaller than they are now. As they grew larger and became harder to steer a small mizen was added to help the helmsman to get the big rudder over. The exact date of this important change is uncertain, but it was probably about the year 1816, when the end of the French Wars gave a great impetus to the construction of small coasting vessels that could at last do their work without fear of French privateers. It is known that there were numbers of barges with mizen masts in 1820, the invariable custom being to step the mast on the head of the rudder - they were all steered with a tiller so that it could not be stepped inboard - with the sail sheeted to the rudder itself. When the helm was put down the sheet was pulled to windward and the natural tendency was to force the stern round. That was the only purpose of the mizen, its assistance in propelling the ship being negligible. In the ’eighties the wheel was introduced into London barges instead of tiller steering; this change permitted the mizen mast to be brought into its present position. The ordinary Thames barge still has a small mizen, although generally larger than it was when the mast was stepped on the rudder-head. Some barges of the sea-going type have a large boom-and-gaff sail aft. These barges often hail from the East Coast centres such as Mistley or Harwich in Essex, or Ipswich in Suffolk, but they do most of their work in or from the Thames. ALONGSIDE A WHARF these two sailing barges are waiting to discharge their cargoes. At low water they will be high and dry, but their flat-bottomed hulls allow them to take the ground without canting to an uncomfortable angle. The barge in the foreground is the Mocking Bird. She was built in 1877, and is of 57 tons register. Until the early part of the nineteenth century all barges were “stumpie” rigged, that is, they had no topmast or topsail. There are still numbers of them on the Thames and Medway. These surviving “stumpies” are, however, mostly for river work only and for special purposes. The regulations, for instance, strictly limit the amount of gunpowder or other explosive to be loaded into a single barge. For work of that sort a “stumpie” is all that is necessary. In some of the innumerable creeks into which the barges penetrate only a few tons of cargo are offered and a big barge would be wasted on this duty. But the “stumpies” are in the minority. Although many people can remember the days when most barges were without topmasts, nowadays at least nine out of ten are fitted with them, for not only do they permit greater speed on passage, but they also enable the vessels to come alongside under topsail only. The headsails have developed on much the same lines. Originally the forestaysail was the only one considered for a barge. Even to-day the bowsprit, hinged to steeve to an angle of elevation practically upright for minimizing the space occupied at a quay or for beating against the wind in the river, is not universal. For many years the jib, when it was carried at all, was set “flying”, but nowadays practically all barges have it running on a stay in the same way as the foresail. The outer, or flying jib, is of light material, generally of white canvas - all the other sails are rich, deep red - and it is often set over the fore-staysail in a barge that does not carry a bowsprit, or has it steeved up. The main sheet is always arranged in the same way, traversing on a heavy wooden “horse” fixed across the deck as it has done since the early days of the eighteenth century at least, and possibly much longer. This is a remarkably efficient arrangement for a vessel with such a small crew, and it is doubtful whether anything else would be as good. That is probably why nobody has been bold enough to suggest an alteration. SPRITSAIL BARGES on the River Thames at dusk, from the oil-painting by the famous marine artist Charles Pears ROI. 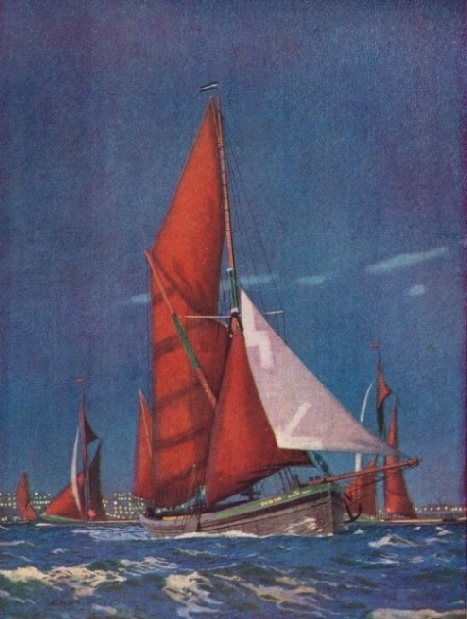 The sails of these Thames barges are a rich warm red in colour, but the lighter sails are white. The hulls are flat-bottomed and the vessels can therefore penetrate shallow creeks and rivers. Thames sailing barges are ordinary workaday vessels but they are astonishingly seaworthy. They are among the most picturesque craft afloat and form a striking contrast to the power-driven vessels which are attempting to oust them from their trades. The mainsail is almost invariably of precisely the same cut and proportions, a fact which gives the barge her distinctive appearance. Most artists have failed to catch this appearance exactly, the conspicuous exception being the late Mr. W. L. Wyllie, whose etchings of barges delight even the bargemen themselves - and they are properly the most jealous critics of anything to do with their craft. In the earliest days the hull of the barge seems to have been of two patterns, one a square box with a bow and stern rounded and the other an enlarged punt. The second pattern is still practically universal for dumb barges or lighters, without sails. The punt principle developed into the swim-headed barge, generally called “shovel-nosed” by river men. For many years nearly every barge had this type of bow, although there are now only three or four left under sail. They seem awkward, but it is extraordinary how well these vessels sailed, pushing their square bows through the water and making a great fuss, but contriving a high speed. The first break-away from this “shovel-nose” was about 1840, when the Medway owners started a new type with a round spoon bow. This form, although it did not itself enjoy great popularity, led immediately to the straight stem that is the rule to-day. At the same time the stem was improved until now the lines of its run are remarkably sweet under a square transom and are largely responsible for the barge’s speed. Another conspicuous feature about the hull is the fitting of lee-boards hinged just below the gunwale on either side to give the barge a grip of the water and to prevent the hull from being blown away to leeward. That is one of her truly Dutch features. A keel would spoil the barge for most of her work, and the centre-board that is fitted into many American barges would take up considerable room in her hold, making it useless for some cargoes. The lee-boards, which can be lowered some feet below the bottom of the hull, serve the purpose equally well. They can be hauled up without difficulty when the barge goes about on the other tack; but the leeboards have to be strongly built and fitted. ROUNDING THE COMMITTEE BOAT in the annual Thames sailing barge race. An excursion steamer acts as the Committee boat and marks the turning-point of the course. She is generally moored near the Mouse lightship in the Thames Estuary. 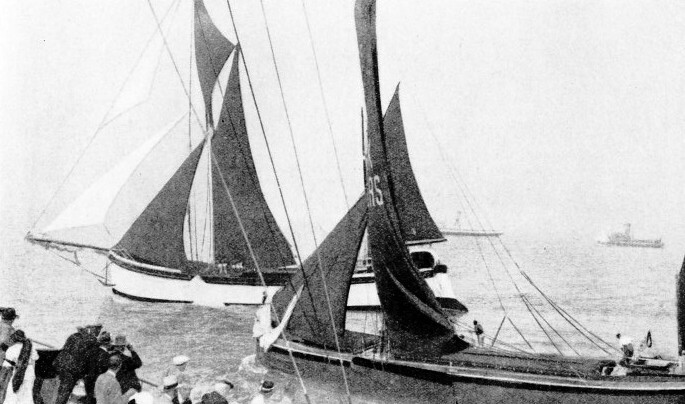 Competitors in this race are divided into four classes, and in this photograph the Alf Everard, of the coasting class, is seen passing the Westmoreland, of the staysail class. These barges are always well built and some are designed to carry 120 tons with a freeboard of 6 inches. The barge skipper exaggerates a little when he claims that his boat is not really loaded until a robin can drink from her deck. Such a vessel may be 80 feet long by 18 feet beam by 6 feet depth of hold. A boat of this type, built with the utmost care, is expensive, and it is customary to defer the last instalment of her payment until she has been two months on service and has proved herself capable. In the days that immediately preceded the war of 1914-18 such a barge would have cost about £1,300; it is difficult to estimate the price now, so completely has the barge-building industry been closed down by the slump. As is only to be expected, the accommodation is not elaborate although it is not by any means uncomfortable for the two men who generally make up the crew. In the old open-hold barges there was only a tiny “cuddy” aft, but when Captain Marryat wrote Jacob Faithful and drew a picture of the barge that he knew in the early nineteenth century, there were a cabin aft and the “cuddy” (small cabin for meals) forward. That is the practice now, a little cooking stove being generally fitted in the forecastle. Most of the cooking, however, is done on the coal stove in the cabin; this cabin is awkwardly shaped because of the after lines of the vessel, but it is quite snug and cosy. The sails of the Thames barge, call for as much notice as her hull and are of just as good quality, at the beginning of her career at least. Tradition says that in the old days sails were of any number of colours, but now they are invariably tanned a rich, warm red with the lighter sails white. With the huge mainsail and big topsail the sail area is surprisingly large, 4,800 square feet in a barge of about 80 tons register. THE GRACEFUL LINES of the sailing barge Cambria, owned by F. T. Everard and Sons, of Greenhithe, are shown to full advantage in this photograph, taken during the Thames sailing barge race in June 1932. The hull of the Cambria is flat-bottomed and is designed to carry the maximum amount of cargo. Her overall length is 90 feet, her beam 22 ft. 6 in., and she is 7 ft. 9 in. deep amidships. These barges were formerly built and equipped in various yards, mostly specialists, on the Thames and in the Home Counties, but the number of these establishments has been steadily decreasing for years and occasionally a contract has gone farther afield. In 1902 Goldsmith, of Grays, one of the best-known firms on the Thames, had some fine steel vessels built in Holland to London design. These are always known as “iron pots” on the river. It is now several years since a spritsail barge was ordered. There are still on service some exceptionally old barges, a few of them a century old and more - a fact that brings a certain diversity of type into the fleet - but the majority are of the same general design. Latterly there has been a tendency to increase the size, culminating in the construction of four magnificent ships by Everard of Greenhithe. These are the Will Everard and her three sisters, the largest and among the finest on the river. Built of steel, they are 97 feet long and carry 300 tons. The truck is 110 feet above the keel and they spread 5,600 square feet of standing canvas, in addition to the lighter flying kites. The Will Everard has made the passage from Hull to Margate in thirty hours, and the Alf Everard from Weymouth to Hull in forty-six hours. These times would be no disgrace to any vessel propelled by sails, and the barges do it with three hands, of whom one is only a youngster. When these ships were built their owners, who built the pioneer British full-powered motor coaster before the war of 1914-18, made every provision to fit. motors into them if necessary. 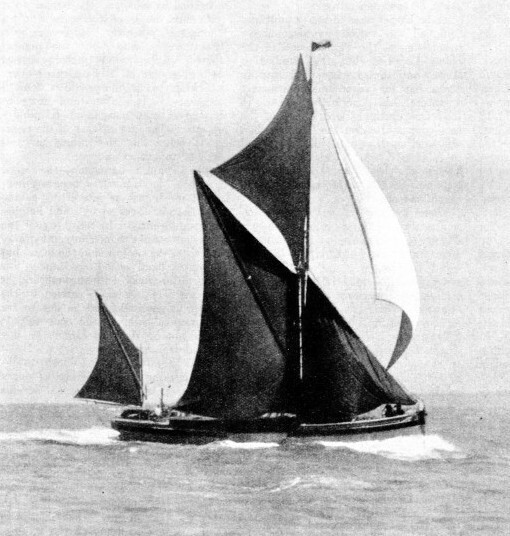 This alteration, however, has never been considered desirable - an interesting fact in view of the pessimists' belief that the sailing barge is doomed to extinction. The Thames bargeman - the word “bargee” has a touch of disparagement about it - is just as interesting as the ship that he loves so well and handles so magnificently. In most barges the crew consists of two men only, invariably known as the captain and the mate, but an extra hand called a “huffier” is shipped for tricky work through bridges and the like. A boy is carried by the bigger barges only, and he has to try his prentice hand at the cooking. It would not be right to forget the dog carried in almost every barge. He is a.good friend and an excellent watchman, barking noisy defiance at every dockmaster or river policeman, but his breed is a puzzle to any dog fancier. SOON AFTER THE START of a Thames sailing barge race. The barges cross the starting line together. Of the four competing classes the coasting class is for barges with a minimum of 70 tons register. There is a separate class for river barges with bowsprits and another for river barges carrying staysails only. The fourth class is for barges of the types illustrated above, but with special conditions applying. The race starts from a point below Gravesend on the Thames. A word must be said in justice to the Thames bargeman apart from his attributes as a seaman, for in popular fancy he is known principally by his reputation for foul language. This is an absolute injustice. His language is no worse than that of any other man who gets his living on the water - except perhaps when anybody suggests that there is “a rat in his fore-chains” - an expression that, for some unknown reason, infuriates every bargeman on the river. How the phrase came about and why it is applied to a barge that has no forechains in any circumstances are insoluble questions. The trades covered by the spritsail barges are legion, although unfortunately they are declining in face of road competition and full-powered coasters. For instance, it is not so long ago that most of the coastal towns for fifty miles on either side of the mouth of the Thames had hoys on regular service. Barges, keeping almost railway time, would take down nearly all the town’s supplies of groceries and the like. The barges still carry coke piled high above their hatches to France, Belgium and Holland all through the winter, although it seems a big risk. Scores of them are employed carrying paper and beer between the Medway and the Thames. Cement and timber give employment to any number. In the old days the hay barges were as numerous as any other type. They were popularly known as “stackies”, and staggered under a 12-feet deck load, with a man sitting on top of it shouting instructions to the helmsman who could see nothing ahead. Bricks form an important business and some of the well-known brick-makers maintain big fleets of their own sailing barges. There are plenty of unusual trades in which Thames barges have engaged from time to time. Two went out to South America rather more than twenty years ago. Their heavy sprits were lowered on deck and they went out temporarily rigged as ketches with crews of Ramsgate fishermen. They made excellent time. Many Thames barges have been converted into comfortable yachts and houseboats. Reference must be made to the annual races, one on the Thames and the other on the Medway. In the early ’sixties Mr. Dodd, known as “The Golden Dustman”, organized a proper race which soon became the great event on the river. For a time it was allowed to lapse, but it was revived in 1927 and is now as popular as ever. Nowadays the race is sailed in three or four classes, without handicap. First, there is the coasting class with a minimum of 70 tons register; secondly, the class for river barges carrying bowsprits; and thirdly, the class for river barges having staysails only. The fourth race is for one or other of these types, with special conditions arranged to ensure a more equitable distribution of the prizes. The Thames course is from a point below Gravesend, round the excursion steamer chartered as Committee boat, and anchored as near to the Mouse Lightship (in the Thames estuary) as wind and other circumstances permit, and back to Gravesend. The Medway course is similar but based on Chatham. The rules demand swept holds, working canvas and purely bargemen crews. The spectator can see sailing that is as fine as any to be seen anywhere. There are cups for the owners, cash prizes for the masters and crews of the winning boats, and a small sum for the hands of all barges that complete the course. In addition there are numerous special prizes. The more modern iron and steel barges cannot possibly live as long as the wooden veterans, and it is unfortunately true that new construction has for a time been completely suspended in favour of the full-powered vessel. 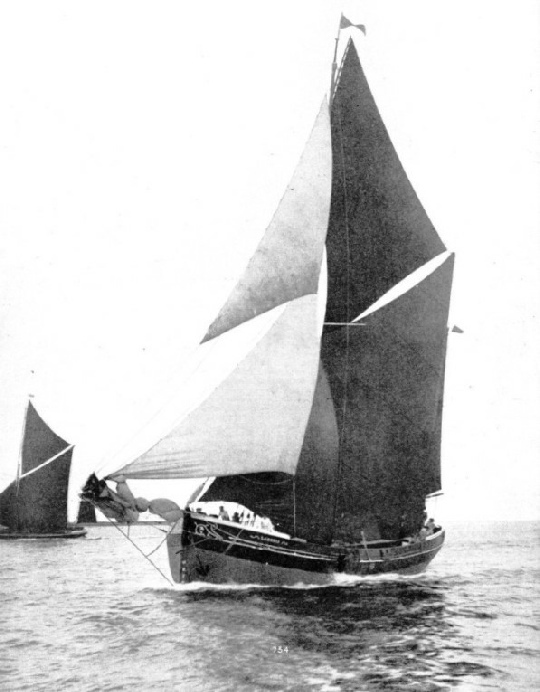 Efforts have been made to fit auxiliary engines of about 100 horse-power into the sprit-sail barges, but not all of them have been successful. 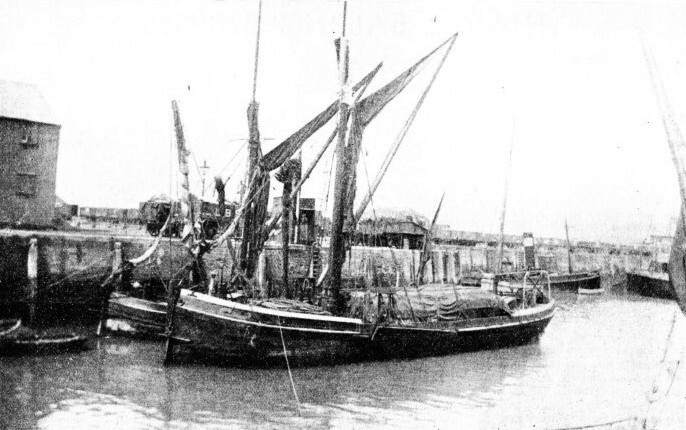 In present-day circumstances the full-powered motor coaster, as improved by the spur of Dutch competition, has certain advantages, but there are many who hope that conditions will change and that the Thames barge, with her beauty, her wonderfully economical running and the magnificent breed of seamen that she produces, will come into her own again. WITH THE WIND RIGHT AFT, the Veronica travels at a fine speed and runs “with a big bone teeth”. Built in 1906, this barge has a registered tonnage of 54. You can read more on “The America’s Cup”, “Great Voyages in Little Ships” and “Romantic Sailing Coasters” on this website.